After the passing of Eric's father-in-law, Eric wanted to create a tribute of her dad for his wife, Jennifer. 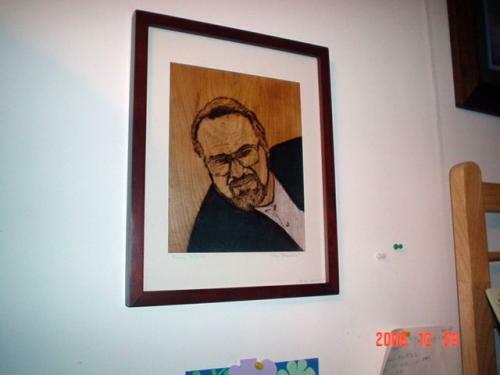 The portrait is Eric's first attempt at wood burning, or pyrography. The entire family was deeply grateful for such a beautiful gift which now hangs graciously on their wall. A lot of heart and soul goes into every one of Eric's wood sculptures; this is just another fine example of the talent Eric has for making the wood come alive.